The commercial maritime sector is highly vulnerable to theft and piracy, and presents a probable target for a major terrorist attack. The best way to prevent losses is to apply lessons learned in another arena-–the struggle to curb drug smuggling. This effort has shown that successes can be achieved when effective and comprehensive security measures and procedures are implemented at key initial links in the cargo supply chain. The integrity and security of whole system are improved when efforts are focused at the primary "choke point" – the load seaports and their ships. 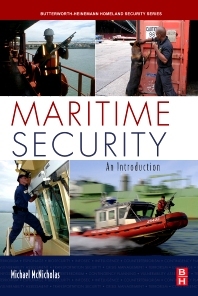 This book provides practical, experience-based, and proven knowledge - and a "how-to-guide" - on maritime security. McNicholas explains in clear language how commercial seaports and vessels function; what threats currently exist; what security policies, procedures, systems, and measures must be implemented to mitigate these threats; and how to conduct ship and port security assessments and plans. Whether the problem is weapons of mass destruction or cargo theft, Maritime Security provides invaluable guidance for the professionals who protect our shipping and ports. Provides real-world experience in Maritime Security from the Managing Director of Phoenix Management Services Group in the USA and Panama. Professionals in the fields of Homeland Security, Criminal Justice, Transportation Management, Logistics Management, Supply Chain Management, and Business Management. Trade Schools, Professional Associations (Association of Industrial Security [ASIS], International Cargo Security Council, BIMCO, AAPA, etc.) and State and Federal Government Agencies. Maritime Security is a textbook that should be required reading for those homeland security officials, the U.S. Coast Guard, policy makers, goverment and private sector professionals, those who sail or take cruise ships to Western Europe, students involved in maritime security, down to hands-on level seaport security professionals nad commercial maritime transport workers...Even if you are not a national security practitioner, Maritime Security is a useful reference to qualify and validate what the popular media are saying and writing about piracy.--Gene Poteat, The Intelligencer: Journal of U.S. Intelligence Studies, 16.2, 2008.